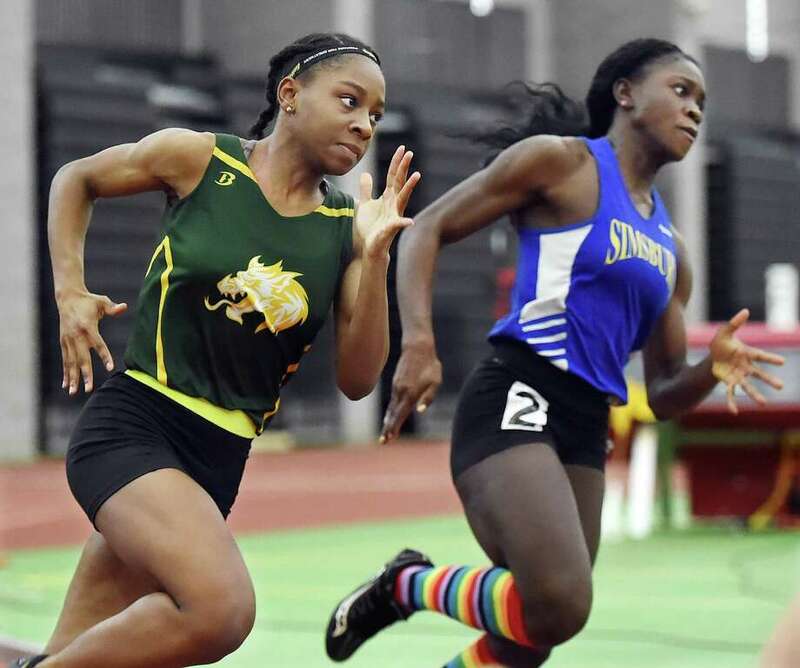 Hamden senior Aisha Gay, left, won the 300 meters at Saturday’s girls indoor track and field State Open in New Haven. NEW HAVEN — When the members of the Greenwich High School girls indoor track and field team reflect on their high school days years from now, they will, no doubt, remember its special 2017-18 season when everything just kept getting better. They will remember this season as the winter in which they captured the triple crown — the State Open, Class LL and FCIAC titles — and made program history in the process. One week after winning its first Class LL championship, this season’s Greenwich squad added to its great legacy, claiming its first State Open title on Saturday at Hillhouse High School’s Floyd Little Athletic Center. Receiving impressive performances in each event, the Cardinals totaled a team score of 56 points. Danbury was the runner-up with 32 team points, followed by Hillhouse (28), Hamden (28), Bloomfield (25) and Fairfield Ludlowe (20). Philippides provided the Cardinals with their first individual victory of the meet, winning the 1000-meter run in 2 minutes, 58.08 seconds. “It’s definitely not my fastest time, it’s eight seconds off my personal-record time, but I’m just focusing on placing as high as I could and scoring points for my team,” Philippides said of her victory. Danbury junior Cassandra Sturdevant was the runner-up in the 1000-meter run (3:04.13). Fairfield Ludlowe senior Alyssa Kraus placed third in the 1000 (3:04.81), Jacqueline Guerra of Guilford was sixth and Julia Ozimek from New Canaan finished seventh. Greenwich’s second individual win came from senior Genevieve DeWinter, who crossed the finish line first in the 600-meter run (1:35.93). Nyia White of Hillhouse was second in 1:36.94, while Emma Langis from Ridgefield finished third (1:37.23). Laura Turner of Norwalk was fourth in the 600 (1:37.71), while Leah Sarkisian took fifth (1:37.89). The meet ended with Greenwich senior Lia Zavattaro placing second in the pole vault with a distance of 11-06. Tyra Finkeldy of Old Saybrook won the pole vault with the same distance, but got to 11-06 on less attempts. Zavattaro was thrilled when she cleared 11-06. The 1600-meter run saw Danbury junior Lauren Moore cross the finish line first in 5:07.21. Weston senior Kathleen Murphy got the second place medal in the 1600 (5:08.76), while Taylor Mascetta of Immaculate was third (5:09.96). Angela Saidman of Immaculate was fifth in 5:11.09 and Meghan Lynch from Greenwich finished sixth (5:17.73). In the 300-meter run, Hamden senior Aisha Gay claimed the State Open title, posting a time of 39.56. Jillian Mars of Bloomfield was second in 40.16. The Cardinals’ other win in the meet came in the 1600 sprint medley relay. The foursome of Olivia Caan, Maggie O’Gorman, Zoe Harris and Philippides garnered the first-place medal in 4:18.18. The Cardinals placed sixth in the 4×200 relay, then took second behind Glastonbury in the 4×800 relay (9:32.19). Brien McMahon finished third in the 4×200 relay with a time of 1:46.90. Freshman Tess Stapleton of Ludlowe captured the 55 hurdles title in 8.36 seconds, while Day of Hamden was the 55 dash winner (7.16). Moore of Danbury took fourth in the 3200 run. Kisha Francois of East Haven won the Long jump (16-11.50), while Amanda Howe of Southington was the shot put champion (40.07.50). How does Ct track stack up against National competition? Does anyone know? I am trying to compare Millrose 2018 winners against the times above, but am not sure if I am looking at the right thing. That is, the Millrose girls revord for 4x 400 I think was 4:24, but it seems crazy that Ct would not be invited posting times of 4:01 and 4:03. So, I think I must be reading the Millrose site incorrectly. Is there a reliable website to reference? Does anyone know? Don’t use the Millrose Games as a comparison. Go to https://www.athletic.net/ and it lists the top times in each event in the country. Right now, that time ranks 40th. Also you have to consider, not all states have indoor track, so you’re not getting a far comparison. And all tracks are different. Some of the top times are clocked on banked tracks etc. Nationals at The Armory is better comparison in March. Sorry for being lazy, but do you think we have any top tier national competitors in our little state? Yeah, compared to years past 2013-16, it’s a tad down in terms of top-tier national athletes by the handful, but not to say we don’t have any. Drew Thompson of Fairfield Prep (he placed seventh last fall at Foot Locker CC Nationals) could contend for a 2 mile title/All-American status. Alexander Korczynski of Windham is a top 20 1 miler (4:15ish), William Landowne of Staples has the No. 2 time right (8:33.81) in the 3K. He could be a contender in 1 mile or 2 mile for top 10 spot. Dyshon Vaughn of Career is No. 6 in the long jump, getting close to 24 feet. Xavier, Staples has some great distance relays, Hillhouse always a contender in SMR/4×4. For the girls … Greenwich’s Emily Philiddies and Glastonbury’s Erin McGill both quality and top 30 800 meter runnerz. Have potential for 2:10. There’s some others and given what combination of runners a team puts together they could put down a great time at nationals. Danbury placed 2nd, Not Hillhouse. Ah. That’s my fault. Thanks for noticing. It’s fixed. Also, Hamden tied for 3rd with Hillhouse. I should have mentioned that in the earlier post. Thank you for taking the time to fix it.